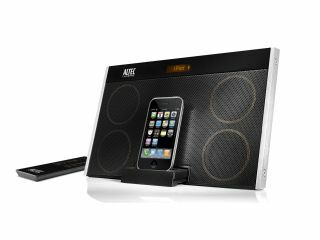 Altec Lansing may not be a household name, but the company knows a thing or two about iPod docking systems. With its roots embedded in audio systems for the good part of 70 years, it was Altec Lansing who initially saw promise in something called the iPod back in 2002 and made one of the first-ever compatible docks for Apple's PMP. To prove that it's still got it, the company has announced the launch of inMotion MAX, a portable iPod dock, which is also fully compatible with the iPhone, other MP3 players and has a built-in FM-Radio. Making sure that the audio that comes out of the system in the best quality are the twin precision-matched, full spectrum speakers. The inMotion MAX dock also utilises proprietary ESS technology for an expanded sound stage and includes a powerful XdB bass system. The main feature of this dock, however, is its portability. Despite looking like it could weigh in for a heavyweight bout, when we got our mitts on it earlier today, the inMotion MAX was found to be surprisingly lightweight. Altec Lansing assured us that it is designed for both outdoor and indoor use, and will handle the occasional splash of beer if you decide to take it away to a festival this summer. A rechargeable lithium-ion battery means you can have up to 3.5 hours of continuous play without having to plug to the mains. Available now, the Altec Lansing inMotion MAX (iMT702) system retails for around £149.99.